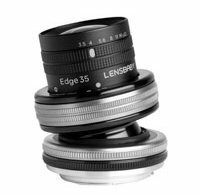 The new Edge 35 Optic is a 35mm selective focus prime lens with an aperture range of f/3.5 to f/22. The lens has multi-coated glass elements and has a minimum focus distance of just seven inches. In total, there are nine glass elements across half a dozen groups. If you already own a Composer, you can purchase the Edge 35 by itself for $250. To purchase the lens along with the Composer II, it is $450. You can preorder via the links above and shipping will begin in April.